-The big winner of the day was Memphis NT Dontari Poe. The Memphis Tigers had a terrible 2011 season, but Poe was one of the few bright spots. At the Combine today, Poe tore it up: 44 reps of 225 pounds on the bench press and an astonishing 4.96 40-yard-dash time. Poe came in at 6'4" 346 pounds, and he looks like an ideal fit as a 3-4 NT. But, with the speed he showed today, there might be teams running a 4-3 that end up showing interest in Poe. Poe isn't perceived as a pass rus threat per se, with only one sack in 2011, though opposing teams often concentrated on containing Poe by hitting him with double-teams, daring Memphis to stop them with other players. It's not fair to compare Poe to Lions DT Ndamukong Suh, but Poe posting a faster 40 time than Suh did will certainly improve his standing in the draft lists for a number of teams. -Robert Griffin III showed that he's as strong in a controlled environment as he was in game action for Baylor in 2011. The big winners out of this are the Rams, who Adam Schefter reported a few days ago will trade their #2 overall pick to the highest bidder. Schefter broke the Bradford-to-Rams at #1 overall news before the 2010 Draft, and his confirmation matches the speculation that many had going into the combine of the likelihood of a team trading up to #2 overall to select RG3. In turn, that's a win for Minnesota at #3, which wasn't going to be in the running for a QB after drafting Christian Ponder in the first round last year. If Luck and RG3 go off the board at #1 and #2, that would give the Vikings an opportunity to pick whoever they want at a non-QB position. That could end up being USC OT Matt Kalil or LSU CB Morris Claiborne (or any other number of top prospects), but in essence it represents #1 overall pick value at the #3 pick price for the Vikings. -The battle for the number two RB prospect spot behind Alabama RB Trent Richardson remains murky. Virginia Tech RB David Wilson had become the favorite in some circles heading into the draft, though several other RBs made strong cases for themselves in Indy. Perhaps the best gain was made by Utah State RB Robert Turbin, who ran a sub 4.5 40 yard dash and tied Boise State RB Doug Martin for the most 225 pound bench press reps at 28. Martin, who wasn't exactly a secret after posting back-to-back 200+ carry and 1,200+ yard rushing seasons, reaffirmed his ability with a strong showing at the combine. The reality is that, beyond Trent Richardson, it will be extremely difficult to pinpoint the second RB to go off the board, in large part because the needs of a given team may vary between needing a three-down back, a bruiser, or a speedster. The deep RB class creates a problem for the top guys, since a team deliberating between using a first rounder on a running back or QB/CB/DE/OT will have to consider the potential depth at the position later in the draft. There will be plenty of RB talent well into the draft, whereas the volume of elite players at other key spots will likely be lower. It's a double-edged sword for running backs competing in a deep RB class for a league where the passing game (and defending the pass) is more important than ever. 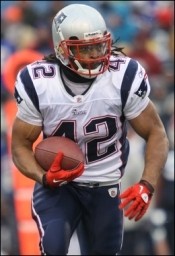 We've gone beyond just the two-platoon RB approach from the Colts/Bears in Super Bowl 43 to a matchup earlier this month where the Patriots started an undrafted running back (BenJarvus Green-Ellis) against the Giants starting a seventh-rounder (Ahmad Bradshaw) supplemented by fourth-round bruiser Brandon Jacobs. The 2005 Draft was only seven years ago, but the league has changed so much since then that now the idea of three running backs going in the top five seems unthinkable. Even top RB prospect Trent Richardson going in the top five (or ten) seems unlikely to me, not because of anything to do with Richardson but because of the scarcity at other positions for elite players. There will be great RBs on the board in rounds 3-4, something I can't say with much certainty about any number of other key positions. -Regarding the combine overall, it's important for evaluators to not put too much emphasis on the numbers in a given workout. Guys might show red flags with underwhelming performances, such as Ohio State OT Mike Adams not cracking 20 reps in the 225 pound bench press, but it's important not to overlook a player's overall body of work because of a strong or weak performance in Indianapolis. Unless the NFL replaces the opening kickoff with the XFL Scramble, 40-yard-dash speed is not specifically relevant to any specific play int the NFL, but the 40 remains the gold standard as far as the general public goes in comparing one player's speed with another. Others might suggest that the 10-yard split is more relevant, but it's difficult to pin down a certain series of workouts that allow for specific projections and ordering. There are simply too many variables involved, including some players having a skill set that fits one type of approach (e.g. 3-4 defense, West Coast offense, etc.) much better than others. Up next: an updated 2012 NFL Mock Draft, going up either late tonight or tomorrow here on Draft King. Also, tune in tomorrow (Tuesday) at 6:15 p.m. ET to my weekly segment on the Batchelor Pad show. It's looking as if that will become a regular timeslot for me, which hopefully will be helpful for those interested in listening. It's a mix of two passions of mine: NFL football and radio. Listen in tomorrow and enjoy!